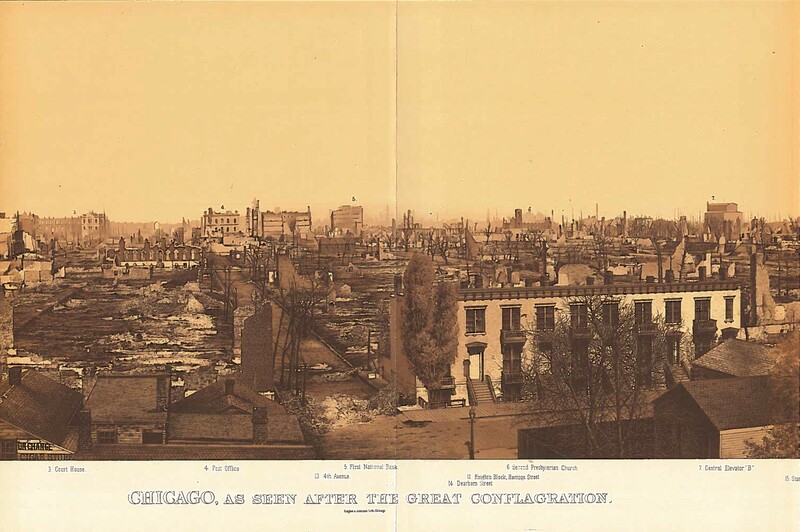 On the night of October 8, 1871, fire spread across Chicago. While the cause of the blaze is unknown, its origin was at 558 West DeKoven Street—an address that today is home to a Chicago Fire Department training facility. 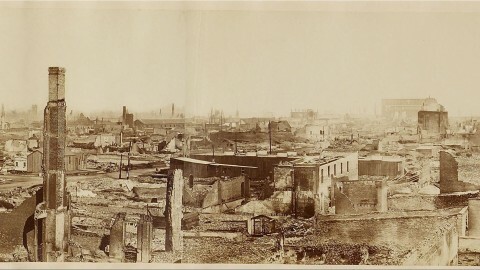 An estimated 300 people died and 100,000 were left homeless by the three-day inferno that erased 2,100 acres of the city. The center of Chicago and the heart of the business district were wiped out. Yet, just 20 years after the fire, the city’s population had grown from 300,000 to 1 million people. While many wooden houses and businesses were leveled by the fire (plus 500 miles of wooden sidewalk! ), some multi-unit residential and institutional buildings were already being built using solid masonry construction. 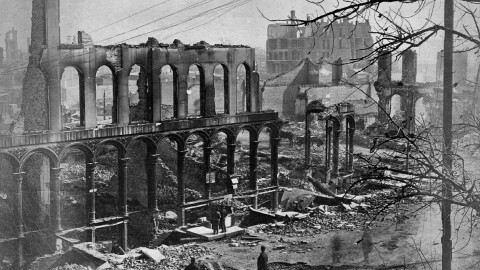 And because much of the city’s major industries were not destroyed in the fire, those economic engines continued to fuel the city’s growth and rebuilding. 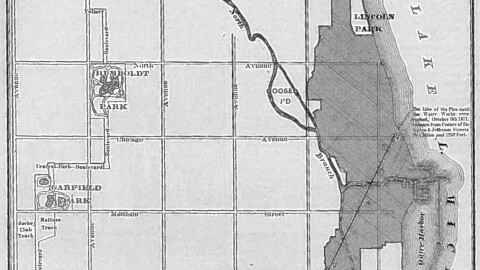 Booming industries such as the Union Stockyards and lumberyards were located outside of the burn zone, which was roughly Halsted Street east to Lake Michigan and Roosevelt Avenue north to Fullerton Parkway. Timing is everything. By 1871, Chicago had already claimed a central role in the U.S. economy. 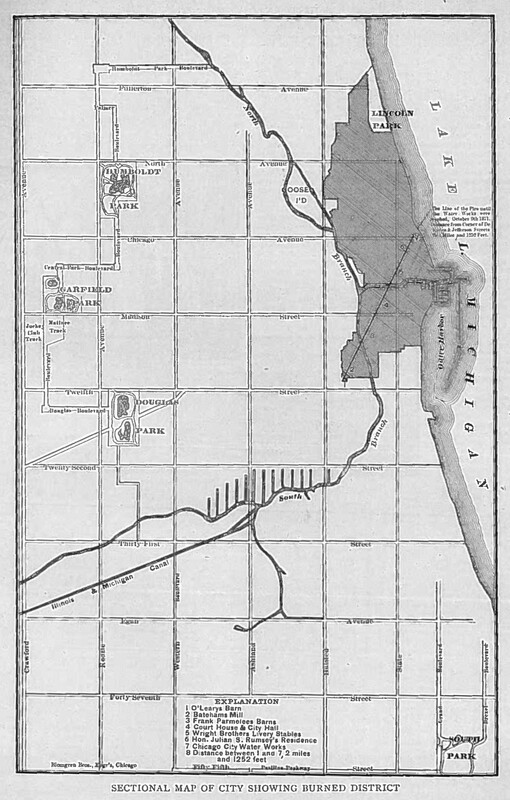 It was the most important processing point for raw materials heading east from the frontier and the biggest interchange in the new national railroad system. Timber and paper industries took hold first, then came meat packing and steel production. Chicago’s old wooden infrastructure may have slowed industrial growth and the development of lands for residential and commercial use. But within months of the fire, a land rush began. 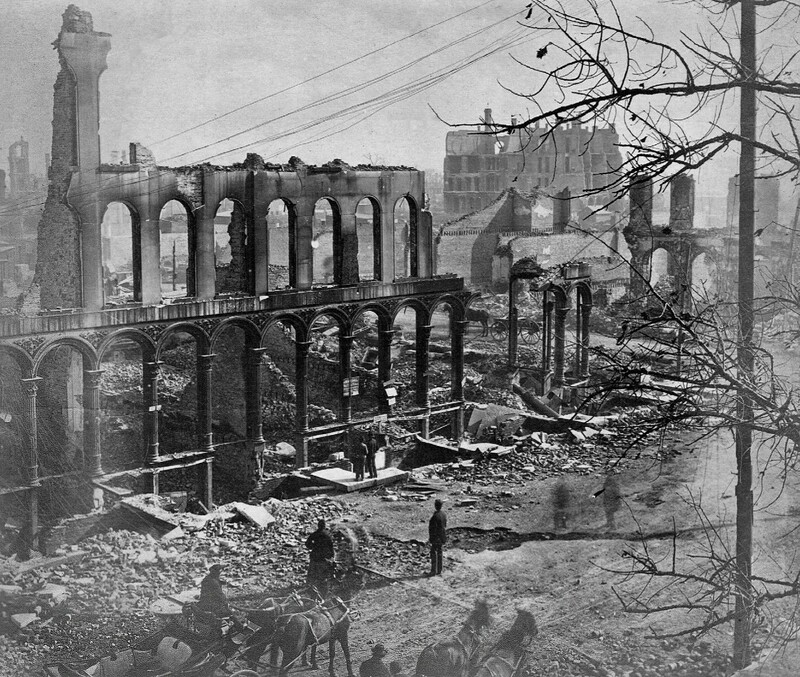 Following another destructive fire in 1874, new building codes were written to ensure that most new construction contained more fire-resistant brick and stone. The myth is often told that the fire cleared the city—wiping the slate clean so tall new skyscrapers could be designed and built. But in reality, a different story unfolded. Immediately after the fire, both downtown and in the neighborhoods, new construction looked very similar to what was built before the fire. With time and money at stake, as often happens after a natural disaster, business owners quickly rebuilt what they knew. Typical four-story downtown commercial buildings were often a hybrid of brick, stone and iron construction. It would be another 10-15 years before the earliest skyscrapers—8 to 10 stories, with structural steel frames, elevators and innovative foundations—would come to replace those first post-fire buildings. Old Town gives us a glimpse of what pre-fire Chicago looked like. Although the neighborhood was nearly leveled in the fire, it was immediately rebuilt in a similar style and scale. Old Town avoided (through a strong-arm political deal) the new boundaries that dictated fireproof construction. As a result, the two-story wood-frame cottages in the area resemble the Italianate homes and humbler two-story worker’s cottages found throughout the city prior to the fire. Still more questions remain. How many of the 18,000 structures vanquished in the fire would have outlasted the twin threats of growth and neglect to reach the present day? 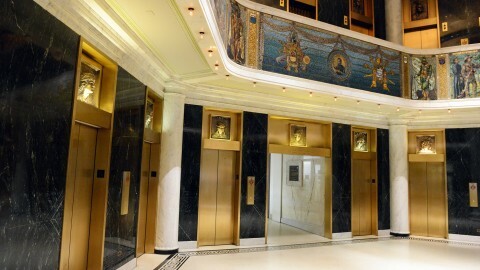 Would the mansions along Monroe Street, Michigan Avenue and Wabash Avenue have survived the early skyscraper boom? Would creative new skyscrapers have been designed as early without a push from skyrocketing land values downtown? 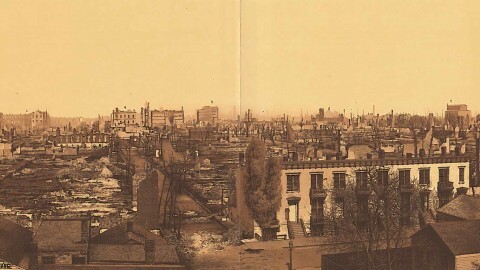 It’s interesting to speculate on how the city would be different without the Great Fire of 1871. Many historians agree that the city that rose like a phoenix from the ashes would likely have kept growing without the fire. Perhaps it would have done so without the grand plans and large population boom that fueled commerce, construction and innovation into the 20th century. Nearly 150 years later, few people can doubt the significance of the fire in Chicagoans’ minds. Today, it’s remembered as the second of four stars on the Chicago flag. 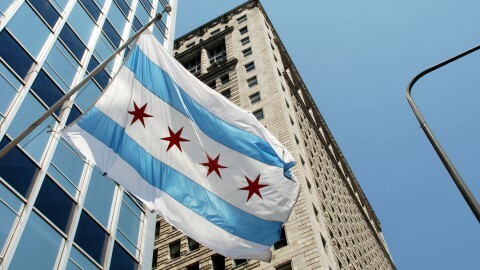 The next time you see the flag fluttering on the side of a building, you may recall the story of a windy day in 1871 when Chicago changed forever.